Well, hello there color lovers! Today I'm sharing one of my all time favorite color palettes for Spring and Summer weddings! What's romantic, and sweet, and looks like it was totally pulled straight from the pages of a gorgeous fairy tale? Say hello to today's peachy palette! I don't know about you, but here lately I just can't get enough of these lush and lovely garlands. And the more the merrier, I say! I love this bride's look with her cascading blond hair, a touch of lace, and the softest looking makeup. And this invitation suite by Paperknots? Yeah, I'm pretty much obsessed with that! I love how the floral accents mimic the look of the floral garlands I've included here. Totally dreamy, if I do say so myself. Oh, and did someone mention grapefruit margaritas? Yes, please! I'll take two. Anyone want to join me? 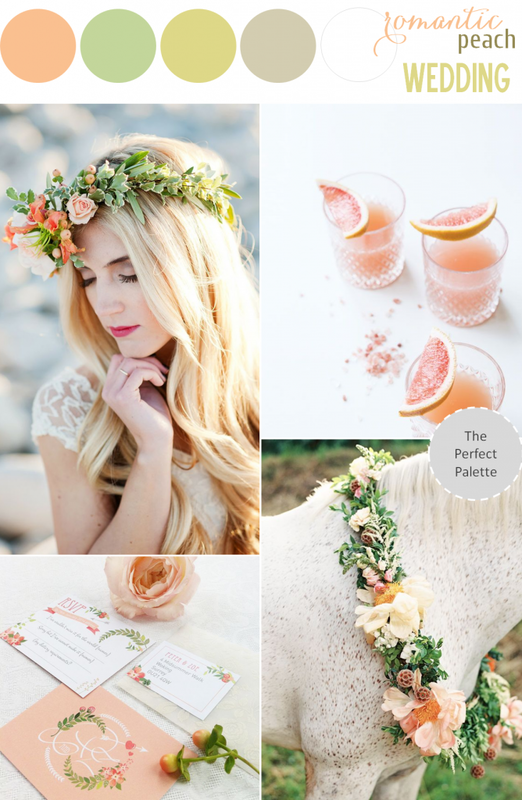 8 Comments " Color Story | Romantic Peach Wedding "
Grapefruit margaritas? YUM!! I love this board, the colors are perfect for summertime! I love these colors and the garlands. There's an abbey in Ireland I've dream of getting married in and draping the stone walls with garlands. And those margaritas, yes please! This is such a perfect color combination! That garland around the horse's neck is fantastic! Gorgeous colors too! What a lovely inspiration board. I especially love it when brides incorporate their color palette in their signature cocktails! Wish I could join ya on those grapefruit margaritas because they look amazing haha, but this board is simply dreamy!